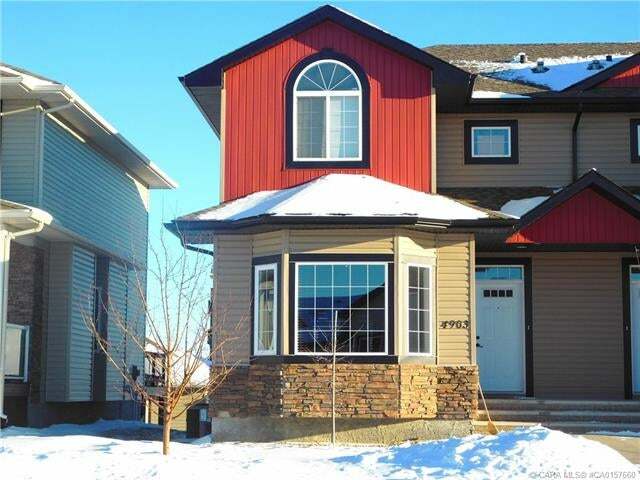 Exceptional 4 bed/4 bath half duplex conveniently located near shopping, west end amenities and the golf course. You are sure to notice the welcoming open floor plan flooding with abundant natural light. The main floor with wonderful hardwood floors offers an elegant living room with a bay window and a cozy gas F/P. A lovely kitchen with beautiful cabinetry, granite countertops, island with B/I dishwasher and the dinette with easy access to the deck. Furthermore, a den/office and a powder room complete this level. The upper level consists of a great master bedroom with vaulted ceiling, ensuite, and a W/I closet along with 2 more bedrooms, 4-piece bath and a laundry closet. The splendidly completed lower level adds a large family room, bedroom, 2-pc bath and storage space. This well kept home comes with a new HWT and some refreshing new paint. Additionally, you will treasure the central air conditioning along with back alley access and the double heated garage. Come fall in love with your next HOME!